One Sentence Sum-Up of the Wedding Vibe: Embracing the spirit of aloha in a no-worries party where our friends and family finally meet. Planned Budget: Ideally, the magical $10,000, but under $14,000 became our target. That’s what the venue’s package would have cost and we knew we could do it for less. The venue and catering, followed by rentals. Choosing the venue was initially our largest stumbling block. We knew we wanted to get married on the North Shore of Oahu, and we wanted the freedom to use whatever vendors we wanted. I poured many frustrating hours into looking for a rental house that would double as venue and accommodation, but it became more trouble than it was worth. We chose Sunset Ranch because it looked beautiful and the reviews were great, which was all we really had to go on. It cost much more than we had intended to spend (about $2,500), but man did it feel good to walk up on the day and see that killer view. Our caterer smashed it. The food was so good, the service was impeccable, and we got much more than we’d realized. This was an area where we were always willing to allocate more funds, because we wanted local food that was sustainably sourced, plus options for vegetarians. The best way I can describe the food was Vietnamese-Hawaiian fusion. My dad, a notoriously non-adventurous eater, said, “I didn’t know what anything was, but each bite I took was more delicious than the last.” Lan, the caterer, completely transformed our plain white cake by spontaneously decorating it with a wildflower. Her staff packed up leftovers in a giant metal tray for us at the end of the night, which Jared and I ate unabashedly in the airport two days later as we waited for our inter-island honeymoon flight. We spent zero money on flowers. While I like them, I just didn’t have the energy to care in the end, and I’m pretty sure no one noticed. The other thing no one noticed was that I didn’t have shoes on. I was able to do this at the last minute because I knew I’d be on grass all night, so it was fine. Although we spent no money on music, we did allocate several hours of effort. Despite the dance playlist not being used, I’m glad that Jared and I sat down together to create it. Then there was the $15 coconut cake, which ticked all the boxes. All along, Jared had this idea that halfway through our first dance, he’d grab his mom and I’d grab my dad, then we’d do the parent dances and our dance all in one. I was never really comfortable with the idea, so we agreed to just see what the vibe was in the moment. During the musical interlude in “Better Together,” he said, “Get our parents?” I said, “Yep,” and it went so smoothly. Our parents were happy to be included, his dad brought my mom to the dance floor too, and we switched back to each other by the end. It was a really nice moment. In terms of what was worth the money we put in, I can say now that there’s nothing we splurged on that I regret. The food was worth it. The venue, too. Definitely our photographer, who charged a bargain $1,675 and fit in so well he was like one of the guests. We spent about $200 on custom-made stubby holders imprinted with the save-the-date image my mom had designed, and they turned out great. 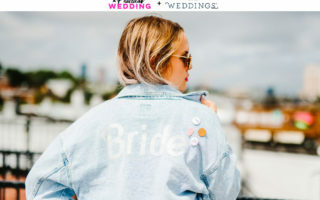 Nearly all of our vendors were chosen based on online reviews alone, so we really had to trust our instincts—most of them we didn’t meet until the day of the wedding. Luckily, that worked out well. Obviously, the ASL interpreter. She made communication so comfortable for everyone and did a killer job interpreting my dad’s speech, which was evident by all the tears at the end. Finally, having the wedding in Hawaii was totally worth it. Everyone who came made a holiday out of it, and ninety percent of our guests ended up renting condos in the same area, so it was really easy to hang out together. As soon as I landed in Hawaii I switched out of wedding planning mode and focused on having fun. Had we done the wedding in Australia or Indiana, it would have been bigger, and I know I would have felt compelled to do more in the way of details. Hawaii eliminated so much stress, and that was worth the extra we spent. Arranging arrival transport. I was obsessed with making sure people didn’t have to leave their cars at the venue (we had return shuttles booked), and felt strongly that because we had such a small guest list it would be possible. The night before the wedding I worked out a potentially complicated plan for setting up carpools, which of course didn’t go as planned. Jared’s mom ended up doing several trips prior to the wedding and two of my friends missed their ride, which resulted in unnecessary stress. People are adults. They would have figured out their own way there. Also not worth it—nine months of doubting my dress. 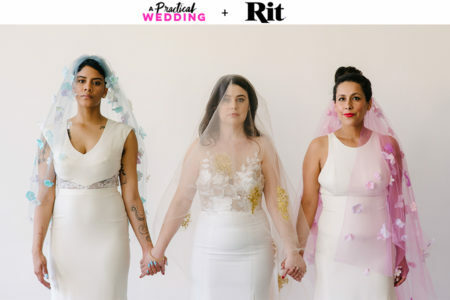 Once I had my hair and makeup done and popped on a last-minute borrowed veil, it felt perfect. I also let go of the idea that I was going to sell the dress once I figured out that trying to keep it clean would hinder my fun on the day. We cut off the train and the hem was filthy between the mud and intermittent rain showers. I ended up giving it to a thrift shop during our honeymoon and the ladies there were thrilled. If we’d paid for her, our day-of-coordinator would have gone straight into the “Totally Worth It” category. At the beginning of the planning process I made sure to follow all of the vendors I liked on social media, just in case they ran promotions or contests. We lucked out and got a runner-up prize of partial day-of-coordination services from Let’s Do This!, which really pulled the whole day together. A week before the wedding, I had an email from the rental company. I cringed, thinking that there was something we’d forgotten to do but it turned out to be an upgrade—there had been a wedding a few days before ours, and they’d hired a fancy clear top tent with café lights and chandeliers. It made more sense to leave the tent there, which we happily agreed to. We’d initially booked the smallest tent possible with the least amount of lighting. While the original rental would have been fine, the upgrade created some serious atmosphere and allowed us to fit the buffet table under the tent rather than on the lanai of the house. Our friends and family were awesome. At some point in the week, every single guest made it very clear to us that they were available and happy to help if we needed it. Just knowing that they were all behind us made the days leading up to the wedding less daunting. Come to terms with the budget and move the eff on. It still blows my mind a little bit how much we spent, but it helped that we had a two-year engagement and paid for everything on a rolling basis. Further advice: don’t be afraid to ask for very specific details from your vendors. We somehow didn’t realize that the signature cocktails offered by our caterer were for the whole night. Had we known, we would have bought less wine and beer. Even further advice: You are hiring professionals. They know what they’re doing, so quit picturing yourself helping the caterer set up the serving table. I would say don’t worry so much about how the guests are going to get along, but I couldn’t have known how well it was going to go until it happened. Worry isn’t one of those emotions you can turn on or off, but you can try to have a little more faith in your people. And as for numbers? Twenty-four guests was perfect. Lauren: I’m going to cheat by naming multiple moments: Getting ready with my mom and sisters before the wedding. Looking around at all of the people laughing, playing lawn games, and just hanging out, knowing they’d only known each other for a few days. Being hoisted onto the shoulders of Jared’s brother and my sister’s fiancé at the end of the night as the band played “Save Tonight” and closed down the wedding. Jared: The great mix of awesome people we had there and to see all our friends and family interact. The wedding was just a highlight during a fantastic week. Lauren graduated from Indiana University with no idea of what to do next, so she got a working holiday visa for Ireland. Over the next ten years she worked her way around the world, picking up a Master's in travel writing and an Australian fiancé along the way. She is now based in Newcastle, Australia, and still doesn't understand what "settling down" is supposed to mean.